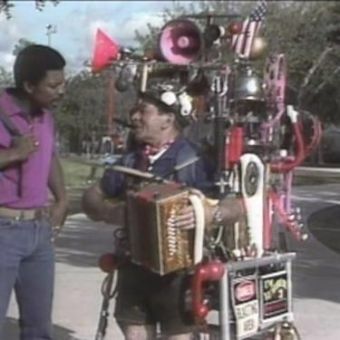 In Ty's One Man Band, the featured book in this episode of the Reading Rainbow series, a man tells a little boy that he will create a one-man band out of nothing. He then takes spoons, a comb, and other items and begins to create music. In this episode, viewers visit a park concert with host LeVar Burton, where several bands are performing. There's a jazz group, a rap band, a salsa combo, and doo-wop singers. Guest Ben Vereen demonstrates his ability to dance and produce music at the same time. The Reading Rainbow music director explains the synthesizer, and the young critics review The Amazing Bone by William Steig and Making Musical Things by Ann Wiseman.